RNAi, short for "RNA interference," is a remarkable way to shut down the expression of genes. Harnessing its power could lead to great advances in medical science and molecular biology. But how does it work? 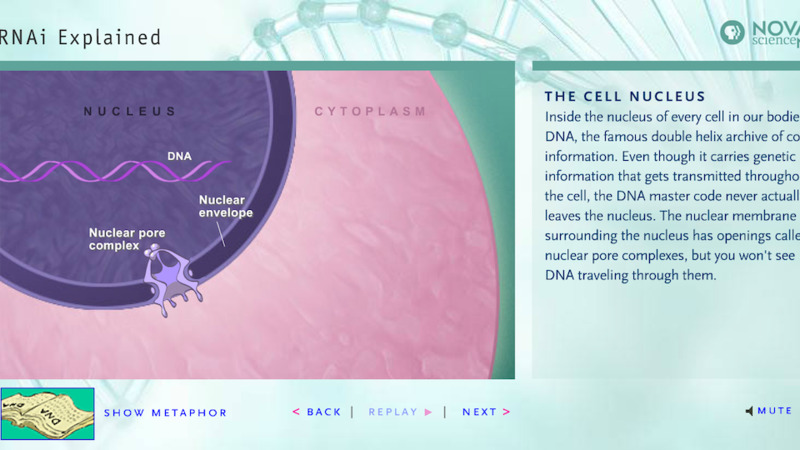 In this interactive, see RNAi explained both through easy-to-grasp cartoon metaphors as well as using the standard terms of biology textbooks. What is RNAi and how does it work? We'll show you using cartoon metaphors as well as standard scientific terms. A wayward petunia leads to the discovery of modest little molecules with enormous medical promise. Researcher Greg Hannon of Cold Spring Harbor Laboratory answers questions about RNAi and its medical applications. Will RNAi, already in human clinical trials, treat a host of diseases, including AIDS, cancer, and Huntington's? Using scientific animations and illustrated metaphors, this interactive activity explains RNAi and how it works.